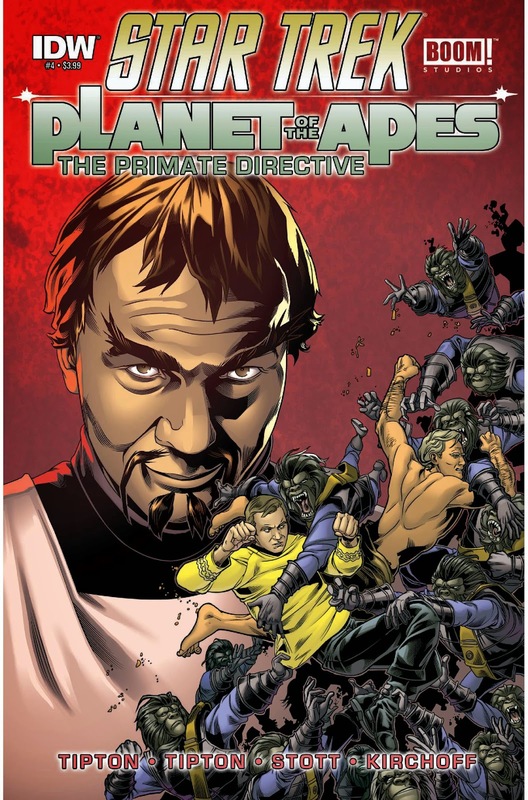 The Fellowship was fortunate enough to obtain a copy of STAR TREK/PLANET OF THE APES: THE PRIMATE DIRECTIVE #4 from IDW Publishing and BOOM! Studios. The story is written by Scott Tipton and David Tipton, with art by Rachael Stott, colors by Charlie Kirchoff, and letters by Tom B. Long. This mini-series should not work, but the Tipton brothers have crafted an entertaining story that you just don’t care about it. The discussion between Scotty and Cornelius about time travel brought a smile to my face (if you’re familiar with the Apes movies, you probably picked up on it). Rachael Stott and Charlie Kirchoff have done a bang up job of recapturing the look of the franchises and making it mesh as well as it can be. This series has a summer blockbuster vibe to it; I would love to see it on the big screen! STAR TREK/PLANET OF THE APES: THE PRIMATE DIRECTIVE #4 is in stores now, or available for ordering at www.idwpublishing.com or www.boom-studios.com.